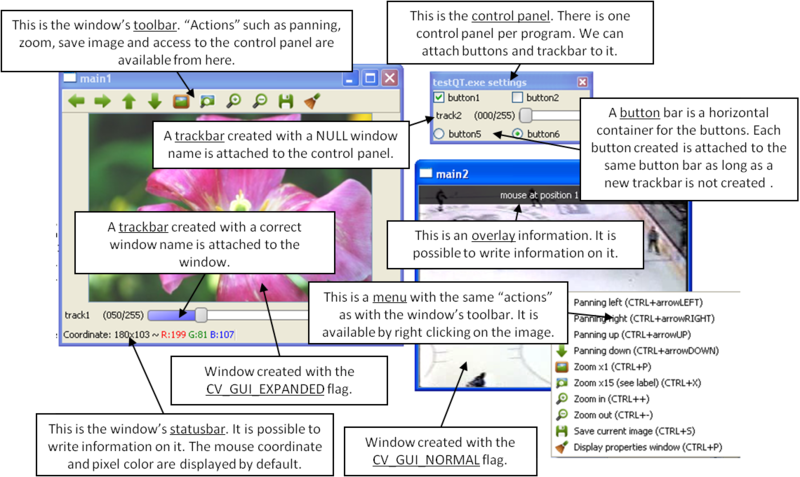 This figure explains new functionality implemented with Qt* GUI. The new GUI provides a statusbar, a toolbar, and a control panel. The control panel can have trackbars and buttonbars attached to it. If you cannot see the control panel, press Ctrl+P or right-click any Qt window and select Display properties window. To attach a trackbar, the window name parameter must be NULL. To attach a buttonbar, a button must be created. If the last bar attached to the control panel is a buttonbar, the new button is added to the right of the last button. If the last bar attached to the control panel is a trackbar, or the control panel is empty, a new buttonbar is created. Then, a new button is attached to it. Changes parameters of a window dynamically. name – Name of the window. CV_WND_PROP_FULLSCREEN Change if the window is fullscreen ( CV_WINDOW_NORMAL or CV_WINDOW_FULLSCREEN ). CV_WND_PROP_AUTOSIZE Change if the window is resizable (CV_WINDOW_NORMAL or CV_WINDOW_AUTOSIZE ). CV_WND_PROP_ASPECTRATIO Change if the aspect ratio of the image is preserved ( CV_WINDOW_FREERATIO or CV_WINDOW_KEEPRATIO ). CV_WINDOW_NORMAL Change the window to normal size or make the window resizable. CV_WINDOW_AUTOSIZE Constrain the size by the displayed image. The window is not resizable. CV_WINDOW_FULLSCREEN Change the window to fullscreen. CV_WINDOW_FREERATIO Make the window resizable without any ratio constraints. CV_WINDOW_KEEPRATIO Make the window resizable, but preserve the proportions of the displayed image. The function setWindowProperty enables changing properties of a window. Provides parameters of a window. CV_WND_PROP_ASPECTRATIO Change if the aspect ratio of the image is preserved (CV_WINDOW_FREERATIO or CV_WINDOW_KEEPRATIO ). See setWindowProperty() to know the meaning of the returned values. The function getWindowProperty returns properties of a window. Creates the font to draw a text on an image. nameFont – Name of the font. The name should match the name of a system font (such as Times). If the font is not found, a default one is used. pointSize – Size of the font. If not specified, equal zero or negative, the point size of the font is set to a system-dependent default value. Generally, this is 12 points. color – Color of the font in BGRA where A = 255 is fully transparent. Use the macro CV _ RGB for simplicity. You can also specify a positive integer for better control. spacing – Spacing between characters. It can be negative or positive. The function fontQt creates a CvFont object. This CvFont is not compatible with putText . img – 8-bit 3-channel image where the text should be drawn. text – Text to write on an image. org – Point(x,y) where the text should start on an image. font – Font to use to draw a text. Displays a text on a window image as an overlay for a specified duration. text – Overlay text to write on a window image. delayms – The period (in milliseconds), during which the overlay text is displayed. If this function is called before the previous overlay text timed out, the timer is restarted and the text is updated. If this value is zero, the text never disappears. The function displayOverlay displays useful information/tips on top of the window for a certain amount of time delayms. The function does not modify the image, displayed in the window, that is, after the specified delay the original content of the window is restored. Displays a text on the window statusbar during the specified period of time. text – Text to write on the window statusbar. delayms – Duration (in milliseconds) to display the text. If this function is called before the previous text timed out, the timer is restarted and the text is updated. If this value is zero, the text never disappears. The function displayOverlay displays useful information/tips on top of the window for a certain amount of time delayms . This information is displayed on the window statusbar (the window must be created with the CV_GUI_EXPANDED flags). Sets a callback function to be called to draw on top of displayed image. window_name – Name of the window. onOpenGlDraw – Pointer to the function to be called every frame. This function should be prototyped as void Foo(void*) . Saves parameters of the specified window. The function saveWindowParameters saves size, location, flags, trackbars value, zoom and panning location of the window window_name . Loads parameters of the specified window. The function loadWindowParameters loads size, location, flags, trackbars value, zoom and panning location of the window window_name . Attaches a button to the control panel. button_name – Name of the button. on_change – Pointer to the function to be called every time the button changes its state. This function should be prototyped as void Foo(int state,*void); . state is the current state of the button. It could be -1 for a push button, 0 or 1 for a check/radio box button. userdata – Pointer passed to the callback function. Optional type of the button. CV_RADIOBOX Radiobox button. The radiobox on the same buttonbar (same line) are exclusive, that is only one can be selected at a time. The function createButton attaches a button to the control panel. Each button is added to a buttonbar to the right of the last button. A new buttonbar is created if nothing was attached to the control panel before, or if the last element attached to the control panel was a trackbar. createButton(NULL,callbackButton);//create a push button "button 0", that will call callbackButton. © Copyright 2011-2012, opencv dev team. Last updated on Jul 04, 2012. Created using Sphinx 1.0.7.